How to install and activate my 3D Video Player? 1. 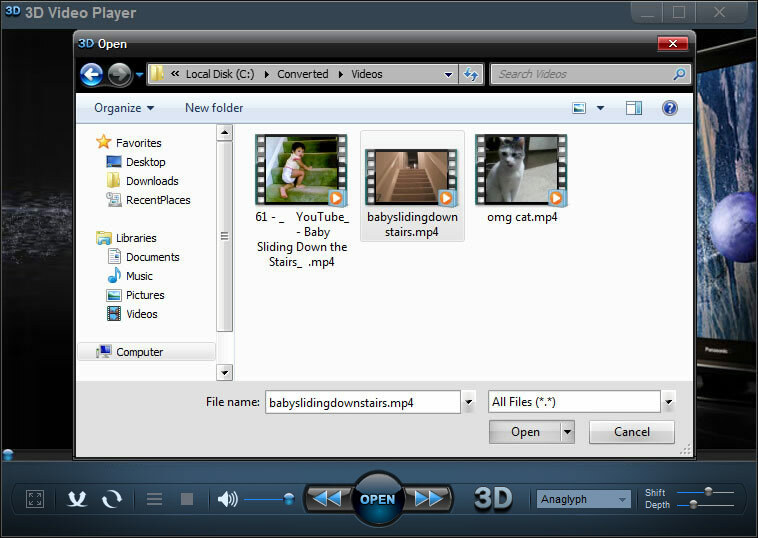 Download, install and run your 3D Video Player trial. "Get Activation Code" and you will receive your activation code. 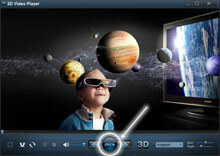 Now you are ready to enjoy your favorite videos and movies in 3D format using the program installed. How to play regular 2D video in 3D mode with 3D Video Player? What are 3D Shift and 3D Depth controls for? 1. Open 3D Video Player. 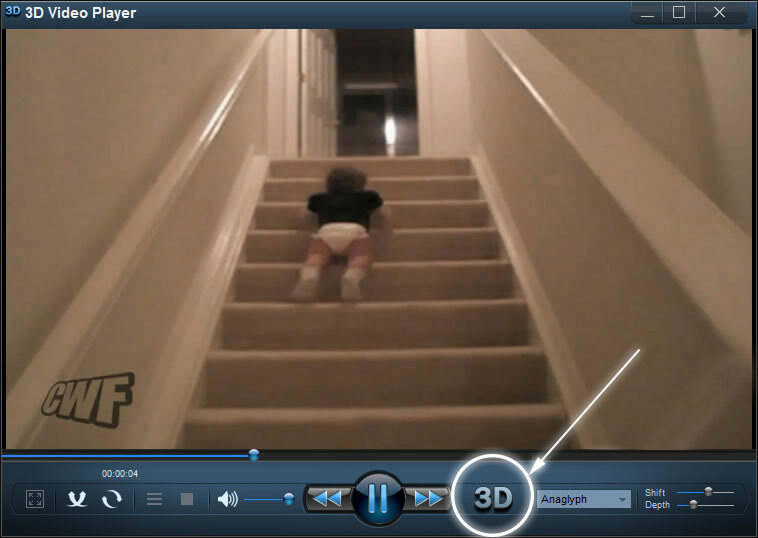 To choose your regular 2D video file you'd like to watch in 3D with 3D Video Player please click on the OPEN button. (Alternatively you can just drag and drop the video file onto the player's interface). In the pop-up window you'll see a list of folders with the files stored on your computer. Choose the video file you'd like to watch in 3D and confirm by clicking "Open" in the pop-up window. 2. The video you've chosen is now buffering (max 10 sec), activated and plays in regular 2D mode. To switch the mode to 3D just click on the "3D" button in the right bottom. The "3D" button is now highlighted and you're able to choose one of the 3D kinds available in the drop down menu: Anaglyph, Anaglyph True, Anaglyph Grey, Side by Side, Side by Side (Half-Width), Top and Bottom, Top and Bottom (Half-Height). Please note: For "Anaglyph", "Anaglyph True" and "Anaglyph Grey" 3D kinds you need a pair of red cyan 3D glasses to see the 3D effect in the output video; for "Side by Side" and "Top and Bottom" options you need your TV or PC to support "side by side", "top and bottom" 3D techniques, as well as you need a pair of NVIDIA 3D glasses that goes together with your 3D TV/PC. Other types of 3D glasses won't work with the output 3D video in 3D Video Player. 3. After a few more seconds of buffering your video file starts to play in the corresponding 3D mode, which you have set. You can change the kind of 3D anytime on-the-go simply by choosing another option in the drop-down menu of 3D techniques. 4. At last put your 3D glasses on (anaglyph red cyan or NVIDIA ones that go together with your 3D TV/PC) and enjoy your 3D video! To achieve maximum 3D effect out of your "converted to 3D" anaglyph red cyan video please manually adjust additional 3D Shift and 3D Depth controls as you desire. These controls won't work in "Side by Side", "Side by Side (Half-Width)", "Top and Bottom" and "Top and Bottom (Half-Height)" 3D modes. Would like to be able to watch your "converted to 3D" videos not only in 3D Video Player, but in any multimedia player/ hardware device of your choice? Then you can download and install 3D Video Converter to convert all your regular videos to side by side or classic anaglyph red cyan 3D. It's easy and fun!